When it was time to decide on a picture for today's Wordless Wednesday I let Peter (DS) choose. He chose the Sorcerer's Hat picture because it's in his favorite park and because he was with me "assisting" when I took it. It helped that I had a copy stored online, as my computer with all my pictures is still out of commission. There are plenty of photo ops in The Studios but for me, this one is the best. Animated film production has included "The Little Mermaid," "Beauty and the Beast," "Pocahontas," "Aladdin," "Lilo and Stitch" and "Brother Bear." Films shot at the studios have included: "Marvin’s Room," "Passenger 57," "Oscar," "Quick Change," "Ernest Saves Christmas," "Splash Too," "Separate But Equal" (Emmy-winning TV mini-series) and "Instinct." TV shows taped at the studios have included: "Sheena," "Full House," "Wheel of Fortune," "World Championship Wrestling," "ESPN College Football Awards," "Talk Soup," "Step By Step," "Barbara Walters Special," "Live! With Regis & Kathie Lee," "ER," "Who Wants to Be a Millionaire" and the HBO 13-part series "From the Earth to the Moon." The Sorcerer's Hat is the structural icon or "Weenie" in Disney Hollywood Studios or as my dear hubbly (DH) still calls it, MGM. A “Weenie” is the visual anchor that's located in each of the Disney theme parks. Cinderella Castle, Spaceship Earth and The Tree of Life are all "Weenies". Wow! those colors are gorgeous!! Thanks V! 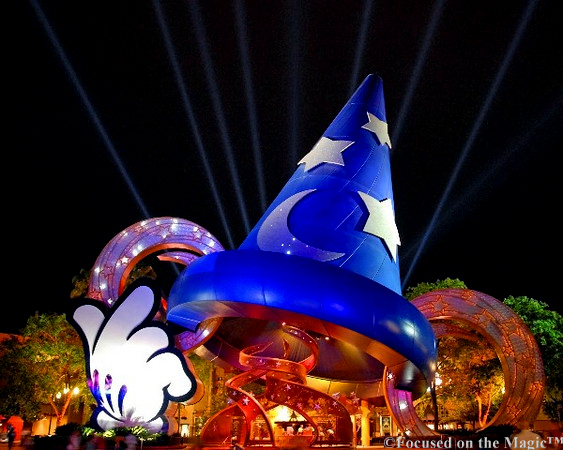 The Sorcerer's Hat looks best at night! Another picture that just makes me shake my head in wonder and say... "That doesn't even look like a real photo. How does she DO that?!?" Lovely shot! So very pretty at night. Amazing shot!! Better than a postcard! :) Thanks for hosting! What a beautiful magical picture! I love how the colors seem to be more vibrant at night. My first time linking up so I'm excited to have found your hop and your blog. LOL I was going to title my post "My favorite Disney weenie" but I'm not ready for that kind of discussion on my blog! Thanks for hosting! That photo is AMAZING! Wow beautiful! Such amazing lighting at night. Thanks for sharing and hosting as always! This is so absolutely beautiful!! Thanks Katrina! I think the link to your Wordless Wednesday might be incorrect. It takes us to The Polynesian Luau which I would love to experience:) Did you want me to change it to your Expedition Everest post? Thanks D! Yes! I'm all for a new computer! DS is performing his techy magic on my old one and hopefully it'll be bigger, faster and brighter for my new *position*! The boy is amazing!! Wow! That is so gorgeous! Thanks for sharing and hosting! I LOVE this photo. I know a lot of people aren't fans of the Sorcerers Hat but I love it at night.